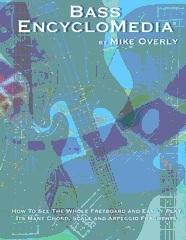 Bass EncycloMedia is Total Fretboard Knowledge In One Book! Bassists Everywhere Are Raving About This Amazing Book That Eables You To Fully Understand The Bass Fretboard. Yes, you're a bass player, but you're more than just a bass player, you're a musician, thinking and speaking the language of music that you then apply to the bass, thus becoming a student of the bass. Bass EncycloMedia is based on the premise that music is a language. If you knew the music alphabet of 12 Sounds and 21 letters and tone numbers on your bass, you could spell any chord, scale, or arpeggio, and then combine them to play any song in any style. So, where does music begin? Like most languages, with an alphabet. Now, you've known the English alphabet of 26 letters most of your life, but, do you know all the words in the dictionary? We know the answer to that question. However, do you know every letter in the dictionary? Yes! So the question becomes, if you know every letter in the dictionary, why don't you know every word? The answer, because you don't know how to spell them. On your first day of school they didn't give you a book of Shakespeare and a dictionary and say Go home you're finished. You understand that's absurd. However, that's what you're trying to do with the bass. You say, I want to play this song. Then you open a song book, see the first chord, find it in your chord dictionary, try to finger it and then move on to the next chord. You will never learn bass that way. Remember the first grade? You memorized a list of vocabulary words that you could spell. This enabled you to read a story that contained those words. Then you learned a new list of words, read a new story, a new list, a new story, and so on. Until finally, years later, you could read that book of Shakespeare. That's how you must understand the language of music. As chords, scales and arpeggios that you can spell Which becomes your vocabulary! Pythagoras told us that if we take a string length and divide the string in half the frequency is doubled and the octave is created. So from the nut to the bridge is one string length and fret 12 divides the string in half. Now, you have 12 frets, one for each of the 12 pitches, letters and tone numbers. While it's true there are 12 pitches in music, there are only 7 letters in the music alphabet: A, B, C, D, E, F, G. These 7 letters are placed horizontally on every string. Most bassists start with a vertical view of the fretboard. However, by not seeing the the horizontal view, they miss the concept of chord shapes which are vertical groupings of the horizontal letters and tones. Trying to remember thousands of chord block diagrams, vertical groupings, by memorizing finger patterns will never work. You learn and remember chords, scales and arpeggios By spelling them! Going a step further, the letters of the C Major scale: C, D, E, F, G, A, B can be thought of as tone numbers or scale degrees. So instead of "Do-Re-Mi", which in the key of C major is C, D, E, we can give those letters tone numbers: 1, 2, 3. Now you can spell in tone numbers as well as in letters. This is very important because we have two ways to think about the bass as letters and those letters as tones, in any given key. Okay, we now understand that music is a language which is expressed as an alphabet of letters and tone numbers. This is the most important idea for Turning A Bass Player Into A Dynamic Musician! Now, getting back to our first analogy, we learned that if you knew all the letters of the alphabet it would be possible to spell all the words in the dictionary. In the same way, if you knew the musical alphabet of 7 letters on the bass fretboard, you could spell all songs! Do you know the song Happy Birthday? Yes? Okay, can you play it? No, why? Because you don't know how to spell it. That's the concept. If you know how to spell it you can play it. In fact, you can play anything you know how to spell! Bass EncycloMedia teaches you how to see the bass in a very simple way, as letters and tone numbers on the fretboard, which enables you to play anything you can spell. The question now becomes, what do you know how to spell? How big is your vocabulary? Remember, no matter what song you want to play, if you have the vocabulary you'll be able to play that song. However, you must have an order, a system, a method to get through the complex vocabulary of the bass. And Bass EncycloMedia introduces this vocabulary in the proper sequence. As you can see in the above diagram, Bass EncycloMedia, doesn't use staff notation to represent music, or tab to show its application on the bass. Instead, fretboard diagrams and an alpha-numeric, letters and tone number, system of spelling is used to develop a vocabulary which will make it possible for you to read and perform any song in any style. As a general statement, Bass EncycloMedia presents its material in four parts: chord, scale, arpeggio, song. In traditional music theory, an "in order" scale is first presented, and then from the letters and tone numbers of that scale, chords and arpeggios are spelled (constructed). However, I've chosen to introduce chords first because we tend to hear the harmony, chords, of a song first, and then play an "out of order" scale melody that fits the chords. In Bass EncycloMedia you will discover five moveable barre chord forms. As was said earlier, these five moveable forms are created by vertically grouping the letters and tones of a chord in one position. However, there are thousands of chord fragments on the bass, and these should also be explored. In addition, seven forms of vertically grouped scales and arpeggios are presented, and once again there are thousands upon thousands of fragmented possibilities. By studing and applying Bass EncycloMedia, you will also discover there are many innovative ways to reveal the hidden secrets of your fretboard such as the 5 Hidden Chord Forms seen below. There are 42 songs included in Bass EncycloMedia, and every song has been analyzed to show each chord's corresponding tonal center scale and mode, providing you with many opportunities to apply the chords, scales and arpeggios as you learn them. Also, numerous substitution ideas are presented, which suggest endless variations. The most complete reference of Bass knowledge Available. Containing 323 Pages of chords, scales, arpeggios and modes necessary to improvise any song in any style. Bass EncycloMedia has a Fast Table, which is a table of contents and an index combined, making it the fastest and easiest way to locate any chord, scale, arpeggio or mode by simply scrolling across the columns and moving down the rows. Bass EncycloMedia thoroughly explains how chords, scales and arpeggios combine with one another, enabling you to play something completely different every time with every song. I want your playing to improve! So, if you're not completely satisfied with your Bass EncycloMedia, return it to me and I will issue you a complete refund. It's as simple as that... There Is No Risk!